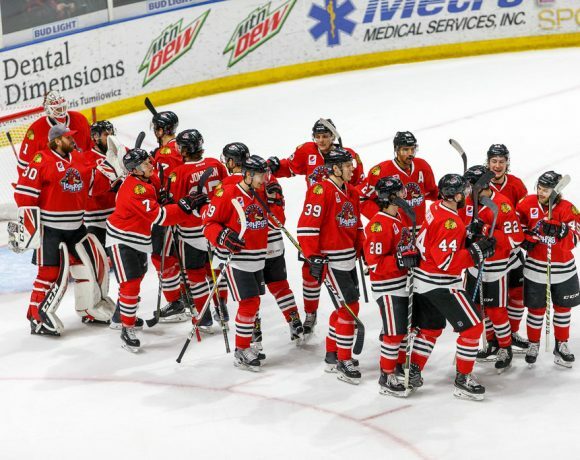 The Rockford IceHogs, AHL affiliate of the Chicago Blackhawks, dropped to the vicinity of the Western Conference cellar with three losses this past week. There is a logical explanation for the IceHogs lounging near the bottom of the league through 19 games. The IceHogs are 28th in the AHL with 43 goals scored. The penalty kill is operating at just a 73.7 success rate. There is a definite lack of speed and skill among the Rockford forwards. The explanation lies in Chicago, where several talented players are having success with the Blackhawks this season. That leaves Rockford a bit thin at forward in terms of scoring. Its usually a goal-by-committee for the IceHogs. So far, the committee has failed to read the memo. Tanner Kero and Mark McNeill, who were the Hogs top goal scorers a year ago, have six goals between them so far. Much has been made of McNeill’s inconsistent performance this season. The sad truth, however, is that McNeill (11) and Kero (10) are right behind Spencer Abbott (12) for the team lead in points. P.C. Labrie, who had a 20-goal 2015-16, has yet to dent a net this season. To be fair, Labrie is playing with Jake Dowell and Kyle Baun on what is essentially Rockford’s checking line. The fact remains that the IceHogs need someone to put the puck in the net. In recent campaigns, Rockford was able to use its team speed to generate high-percentage scoring opportunities. That is decidedly not the case this season. 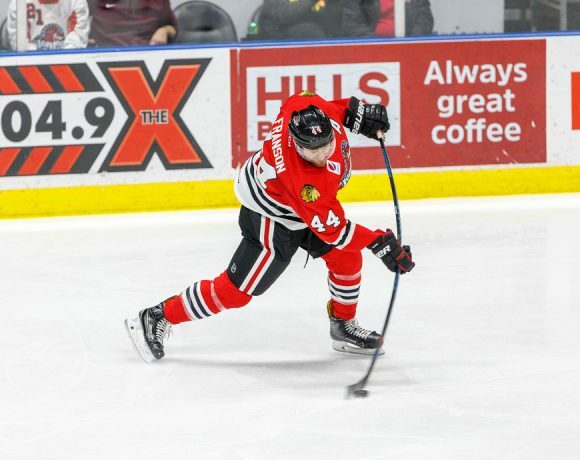 The IceHogs have had to rely on positioning and elbow grease to create offense. It hasn’t been enough to win most nights. The Hogs defensemen have been contributing offensively; Cameron Schilling and Erik Gustafsson each have four goals on the season and Carl Dahlstrom has three. Viktor Svedberg and Ville Pokka have a goal apiece but are getting pucks on goal with regularity. The lack of speed has limited breakout chances for Rockford. It also has had a big effect on the penalty kill, which just can’t be as aggressive as the past few seasons. Players like Labrie and Brandon Mashinter (4 G, 1 A) benefit from team mates putting pressure on opposing goalies and cleaning up around the net. The don’t necessarily create scoring chances on their own. Prospects like Baun (2 G, 2A) and Luke Johnson (0 G, 3 A) fall into this category as well. I don’t foresee a demotion or trade providing top-six scoring for Rockford for the time being. If the IceHogs want to climb in the standings, they will have to step it up on the offensive end. Since I posted Monday morning, there were a couple of moves worth noting. The league suspended captain Jake Dowell two games for a check to the head of Chicago’s Wade Megan Saturday night. The hit came near the end of the second period; Dowell got five and a match penalty for the infraction during the game. Perhaps because the Hogs were left with 12 available forwards this week, Rockford called up forwards Bryn Chyzyk and Evan Mosey from the ECHL’s Indy Fuel. They also recalled defensemen Jonathan Carlsson and Nick Mattson. Rockford let a one-goal lead slip away in the third period. Despite a pair of goals from Chris DeSousa, the Hogs dropped the contest to Cleveland at the BMO. DeSousa struck first from the left half boards after Nolan Valleau freed up a puck on the forecheck. The odd-angled shot found its way past Monsters tender Joonas Korpisalo at 9:23 of the first period. DeSousa’s second tally of the night followed a T.J. Tynan 5-on-3 goal early in the second. His tenacity was on full display, picking up a rebound of Tyler Barnes’ shot on goal and flipping it over Korpisalo to put the Hogs up 2-1 at the 5:26 mark. 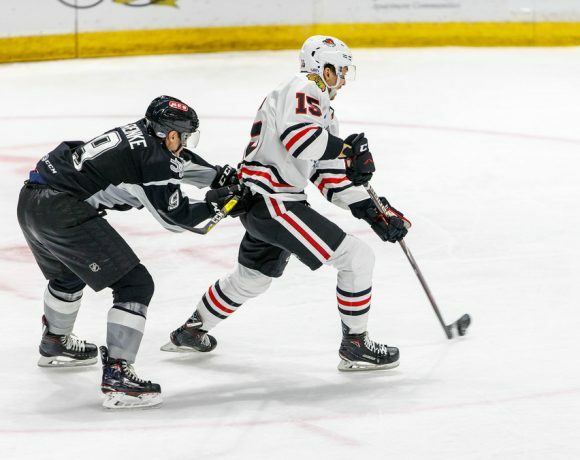 Cleveland’s Joe Pendenza scored the game’s next two goals to put the Monsters up 3-2, but the IceHogs evened it up in the closing minutes of the middle frame. Cameron Schilling threw a puck to the net that glanced off a Monsters defender and into the net with 41 seconds remaining in the second. Early in the third period, Brandon Mashinter set up Viktor Svedberg just inside the blue line. The big Swede sent a laser that caught the crossbar and found twine for a 4-3 IceHogs advantage 1:17 into the third. Unfortunately, Cleveland rallied on the strength of two power play goals. Sonny Milano tied the game in the sixth minute. Daniel Zaar struck the game-winner with 4:29 remaining in the contest. Limited offensively, the Hogs still held a two-goal lead late in the game. The Central Division-leading Admirals got a pair in the final five minutes to send it into Gus Macker Time, then prevailed in the shootout. Tyler Barnes potted both Rockford goals on the evening. The first came 5:55 into the opening period with the Hogs on the power play. Cameron Schilling’s shot from the point was redirected by Barnes past Ads goalie Marek Mazanec to put Rockford up 1-0. Barnes doubled the IceHogs advantage with 2:09 left in the second period when Tanner Kero got him the biscuit on the Milwaukee doorstep. Barnes sent an offering past Mazanec and Rockford was up 2-0 at the second intermission. That lead held up until the waning minutes of the game. Frederick Gaudreau got a puck past Mac Carruth with 4:47 left in the third period. Soon after, Vladislav Kamenev poked the puck out of a scrum in front of the Hogs net for the equalizer with 2:43 remaining. After a scoreless overtime period, Milwaukee’s Kevin Fiala beat Carruth in the opening round of the shootout. Barnes, Martin Lundberg and Erik Gustafsson all were denied by Mazanec to give the Admirals the win. The score was a bit misleading here; Spencer Abbott scored at the buzzer but the Wolves controlled this game and dealt the IceHogs their third straight defeat. After neither team could score in the first period, Andrew Agozzino scored 7:35 into the second stanza. The Wolves built a two-goal advantage midway through the third period when a three-on-one rush up the ice resulted in a Bryce Gervais tally. With 4:48 left in the game, Tyler Barnes redirected a Viktor Svedberg slapper to draw Rockford to within a goal. Just over two minutes later, however, Chicago’s Wade Megan five-holed Hogs goalie Lars Johansson to make it 3-1 Wolves. Abbott’s goal make it look a little closer on paper but that was about it. Late in the second period, Jake Dowell caught Megan in the head with a check attempt and was given a five-minute major as well as a match penalty. 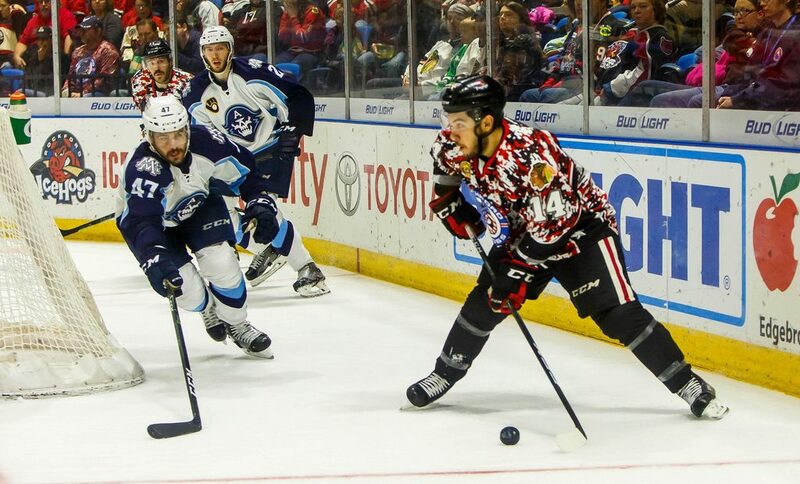 The IceHogs have four straight home games, including three this week. Wednesday gets things started when the Manitoba Moose come to town. Friday and Saturday has Rockford hosting the Wolves and Grand Rapids, respectively. High On The Hog: Who Sits? High On The Hog: Who’s It Gonna Be?